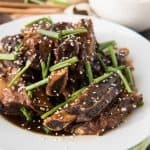 Slow Cooker Korean Beef Short Ribs (Kalbi) are literally falling-off-the-bone tender from a long, slow cooking process braising in a flavorful marinade that doubles as a fantastic slightly sweet and savory sauce that can be drizzled over the cooked short ribs and white rice. Arrange the short ribs in the bottom of a slow cooker, then sprinkle with the thinly sliced onion. Mix together the soy sauce, beef broth, rice vinegar, brown sugar, black pepper, sesame oil, garlic, ginger, and red pepper flakes, then pour over the short ribs. Cover the slow cooker and cook on low heat for 6-8 hours or on high heat for 3-4 hours. When almost ready to serve, whisk the cornstarch into the cold water and pour into the slow cooker, stirring to combine with the sauce and juices from the meat. Cover and cook another 20 minutes, until the liquid has thickened slightly. Remove the ribs from the slow cooker and transfer to a serving platter. Sprinkle with the sesame seeds and green onions. Use a fat separator to remove the fat from the cooking liquid, then serve alongside white rice and the short ribs to be drizzled over the meat and rice.